Indonesian superstar and current undefeated WBA Super World Featherweight Boxing Champion Chris “The Dragon” John (47 Wins, 0 Losses) returns to defend his belt against the undefeated Chonlatarn Piriyapinyo (44 Wins, 0 Losses). After successfully retaining his title at Marina Bay Sands in May this year, John, the “WBA Fighter of Decade” will be making an incredible 17th defense of his World title over a 9 year reign. Piriyapinyo is the current WBC Asian Boxing Council & WBO Asia Pacific Featherweight Champion and is confident he can give The Dragon his first defeat and take his WBA World Featherweight at the same time. Either way, Someone’s 0 has got to go!!! Daud “Cino” Yordan (29 Wins, 2 Losses) also returns to Marina Bay Sands to defend his IBO World Featherweight Title against Choijiljavyn "Choi" Tseveenpürev (36 Wins 5 loss). 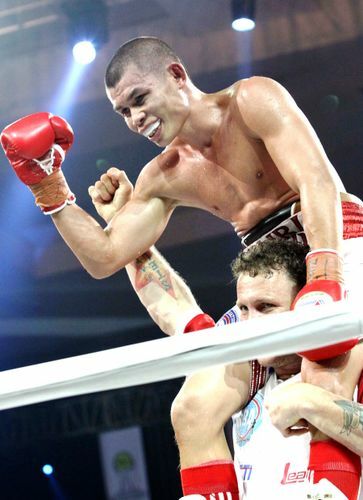 Yordan claimed the belt in May at Marina Bay Sands with a spectacular stoppage of undefeated white hot prospect Lorenzo Villanueva of the Philippines who was dubbed the next Manny Pacquiao. Choi in his last fight was described as "Britain's answer to the legendary Australian boxer Kostya Tszyu" and won the highly prestigious Prizefighter series tournament in October of last year. Singapore’s own Mohamad Nor Rizan will also be on the card in a highly anticipated rematch with Wang Xin Hua from China.